The human foot contains 26 bones as well as muscles, nerves, ligaments, and blood vessels, all designed for balance and mobility. The 52 bones in your two feet comprise about 25 percent of all the bones in your body. Podiatrists diagnose and treat disorders, diseases, and injuries of the foot and lower leg to keep this part of the body working properly. Orthotics are custom made shoe inserts that improve foot function and minimize abnormal foot stress. Orthotics are used to treat or prevent the causes of foot deformity and pain. Very few of us have perfect feet. Almost everyone can benefit from the correction and pain relief that orthotics can provide for conditions such as flat feet, heel pain, heel spurs, arch pain, foot fatigue, ankle pain, knee pain, hip and low back pain, mild bunions, hammertoes, and arthritis. As the foot structure changes throughout your lifetime, you will need to be re-fitted because orthotics are not a “one-size fits all” solution. Daily foot hygiene and proper care of your feet is a key element to preventing foot infections. Patients with diabetes, circulation disorders, numbness, or any immune system depression should be evaluated by a podiatrist at least every six months, if not more often, to prevent foot problems from occurring. Foot care includes thorough examination of skin, circulation, and nerve function; treatment of nails and calluses if appropriate; and advice about proper shoes, socks, and activity. There’s a fungus among us, especially on the toenails. Nails with fungus are difficult to manage because they are very thick and often ingrown into the skin. Management and treatment are equally important to prevent worsening of nail fungus. Painful corns and calluses are growths of hard skin on the top and bottom of the foot. Corns and calluses are caused by repeated friction and pressure against bony areas or on the inside surface of a shoe. Self- treatment by cutting the lesions, using acids, or home remedies can cause further injury and are not recommended. Podiatrists can accurately treat these lesions without injury or pain to the patient. Foot and ankle injuries happen every day. Broken bones, joint dislocations, ankle sprains, blunt trauma, and infections can occur to anyone at any time. Early attention is crucial for proper and timely healing. 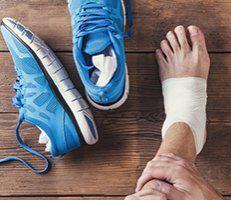 Ankle sprains and fractures, broken toes, lacerations, abrasions and foreign bodies into the skin like glass, splinters, and needles are all examples of trauma that require treatment. Ankle sprains are very common and often go untreated. An ankle fracture can easily be mistaken for a bad sprain. If an ankle injury goes untreated, long-term ankle instability and pain will likely be the result. Proper management and therapy by a podiatrist are necessary to rehabilitate an injured ankle. Contact the foot doctor if you have questions about foot problems and related treatments. Bunions are a common foot deformity, usually hereditary or due to wearing poorly fitting shoes. A bunion is an enlargement of the bone and tissue around the big toe joint which eventually leads to arthritis of the big toe joint. Symptoms include pain on the bump and/or pain inside the big toe joint when walking or wearing shoes. Recovery from bunion surgery usually takes about six weeks, though a patient can walk immediately following surgery wearing a surgical shoe. Bunion surgery is performed in a hospital or surgery center under sedation. Hammertoes are a common foot deformity. Six sets of muscles control each toe. A hammer toe is caused by an imbalance in the toe tendons and joints. Surgery is used to realign the toe and can be performed in our offices or an outpatient setting, depending on the severity of the deformity. Recovery is from 2-6 weeks while you wear a surgical shoe. Local anesthesia is used in the office, and sedation may be used in a hospital or surgery center. Ingrown toenails include pain and swelling of the toe near the nail bed. Ingrown toenails can be hereditary and chronic or an isolated incident. Removal of nail border is done under local anesthesia in our office. Recovery requires one week in an open toe shoe. Occasionally, the nail border may need to be permanently removed due to a reoccurring ingrown toenail by using a special medication to eliminate the cells that grow the nail. Recovery for removing the toenail border is 2-3 weeks while wearing an open toe shoe. Neuroma sometimes called Morton’s neuroma is a chronic nerve irritation causing an enlargement on the nerve segment commonly found between the 3rd and 4th toes. Symptoms can be burning, tingling, and/or occasional numbness to adjacent toes. Many patients feel as though they have a rock in their shoe. Foot surgery is only performed on a neuroma when all other conservative measures have failed. Recovery is 2-4 weeks in a surgical shoe. The surgical procedure for a neuroma requires local anesthesia and can be done in our offices, in a surgical center or a hospital as an outpatient. 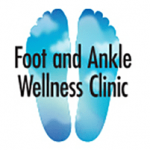 Contact Dr. Mancherian, foot specialist, to make an appointment at the first sign of a problem.